Since fluorite cleaves when struck, forming distinct four-sided pyramids, it has long been associated with psychism. It is most commonly associated with psychic protection and fostering the intellect. Fluorite is said to give the spirit safe journey on astral projections and forays into the spirit world. Fluorite is used to 'purify' and 'detoxify' both the spirit and places. It is often recommended placed around computers and the workplace to reduce stress and relieve 'negative' forces. 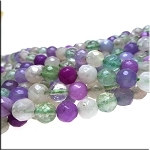 Fluorite, also called fluorspar, adds a refreshing touch wherever it appears.